I always wanted my own oscilloscope. Not that I really needed one or missed it more than a couple of times. But you can never have enough tools! What kept me from ordering one or from buying a used one online so far, was not so much the price. It’s the fact that the space I have to keep my tools is somewhat limited. A regular oscilloscope would be yet another big box standing in my way and gathering dust most of the time. 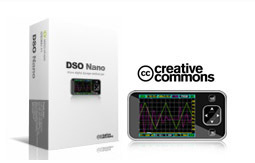 Then, a few month ago, a post on hack-a-day pointed me to Justblair’s review on the DSO Nano. Justblair got his hands on one of the “beta test” models of the DSO Nano, a brand-new pocket-sized digital oscilloscope developed by Seeed Studio. While it has a few limitations and draw-backs, it’s size and the price tag of only $89 do make it a really interesting option. When I checked back two weeks ago, I noticed that Seeed Studio was accepting pre-orders for the final version of the DSO Nano to be shipped on December 10th. So I had to order one. The probes that come with the DSO Nano are supposed to be rather basic, which is alright at that price. Seeed Studio offers a BNC adapter, allowing standard probes to be connected to the DSO Nano. Unfortunately, the adapter was sold out the day that I placed my order. When it was back in stock a couple of days later, I sent an email, politely asking if they could replace the spare probes that I had ordered with one of those adapters. They are both the same price. My email was answered quickly, and Xiang Fan promised to update my order. Great customer service! By now, the DSO Nano seems to be ready, and the shipping seems to be in progress. I can’t wait to try it out. But it probably won’t make it all the way to Germany before the beginning of next year. Well, you always need something to look forward to. I have been documenting interesting software and programming related findings in my own private Wiki for a few years now. This turned out to be really useful in many cases, especially on topics that I would run into only very infrequently. Most of these notes would not be of any interest to anybody else but me, while a few of them might be worth offering to a wider audience. All it would take would be some nice presentation and a little effort to write things down in whole sentences. Or so I thought. When I began tinkering with electronics again, I soon decided this would be a great excuse to start my own blog, sharing my progress. After my initial enthusiasm had worn off, I soon realized that I had somewhat underestimated this project. It takes a good deal of time and effort to write things down in whole sentences and to present them nicely. As a result, there are a few projects that I finished this year that I failed to put up here so far. Most likely, I have forgotten a lot of interesting details by now. But I’ll try and summarize what I do remember.